Planning to do damage this weekend? 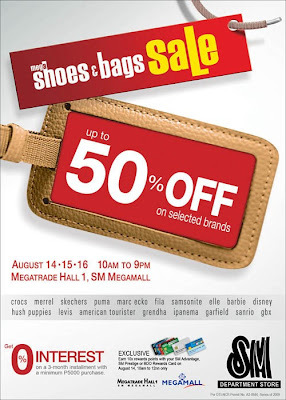 Check out the Shoes and Bags Sale in the Mega Trade Hall 1this weekend from 10 AM - 9 PM. For SM Advantage, Prestige and BDO Rewards Card holders, lucky freakos! You get 10x more points on Aug 14 from 10 AM - 12 NN only. Not only does the early bird get the worm, it gets more points. I went yesterday with the goal to buy a camera bag, ONLY a camera bag oh and these Ipanema flips I've been lusting over. I walked away empty and thankful for self-control. Senses overdrive! Saw local brands like Mario D' Boro, Chelsea, Secosana as well as international brands like Hush Puppies, Puma, Fila, Skechers, Delsey, Samsonite, etc. Despite the chaos, what I love about SM employees is that they also greet you with a smile always ready to help. in the chaos of the other areas. Check out the price range below.